Many families in the South can claim Blue Ridge dishes as part of their family tradition. With their expressive hand-painted designs and colorful patterns, Blue Ridge pottery has become one of the most familiar and distinctive brands of collectible dishes around. Clinchfield Chinaware incorporated a variety of dinnerware shapes and usually depended on decals and gold trimming for their decor. Advertising items were also big business. Generally, Clinchfield designs were precise and formal. Without a doubt, no one could�ve foreseen the design changes yet to come. In 1920 the business was incorporated, and the pottery�s name was changed to �Southern Potteries Inc.� The reinvented pottery was issued a charter and made public, with stock totaling $500,000. Only two years later, Southern Potteries Inc. was purchased by Charles W. Foreman, and the pottery came under his leadership. 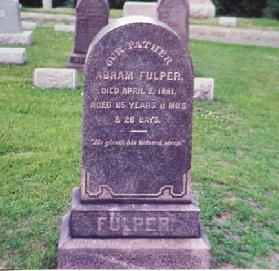 Foreman would later be credited with introducing the trademark hand painting technique that would make Southern Potteries famous. From around 1917 up until 1938, the pottery still primarily used decals for adornment. But after 1938, the hand painting technique had taken on a new intensity and a larger role. The hand-painted wares were often marked �Blue Ridge Hand-Painted Under the Glaze Dinnerware,� and they engrossed Southern Pottery�s attentions. (The �Blue Ridge� name actually arose in 1932-33.) In Blue Ridge, a metallic based glaze was painted to the dish just before the last firing. For this talent, Foreman recruited local women and untrained ladies who were raised �up in the hills� to achieve this fine level of workmanship. There were a few men also, but women dominated the painting staff. Unlike the decals used before, the hand-painted Blue Ridge patterns were less formal yet quite endearing to consumers. The women painters were able to employ graceful brushstrokes and use brilliant colors, all with a great deal of spontaneity �� just as long as they followed the prescribed pattern. 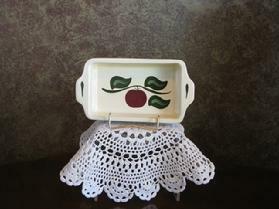 Often times, stamps were used to copy the outline of a design on the dish that was to be painted. Also, painters worked together in small groups. The lead painter in the group would paint the central design and pass it along to the next person who would in turn paint the leaves, and so on. True, some painters were better than others; and many factors resulted in the wide variation shown in the dishes themselves. No two dishes were exactly alike. Blue Ridge dishes were fresh, and their popularity was evidenced by an increase in their industry. Eleven showrooms across the U.S. were established, and before World War II, Southern Potteries was one of the largest pottery works in the United States. Blue Ridge showrooms were located on NY�s Fifth Avenue, to San Francisco, to New Orleans, and to Dallas. Both Sears & Roebuck and Montgomery Ward featured Blue Ridge in their catalogs and stores. 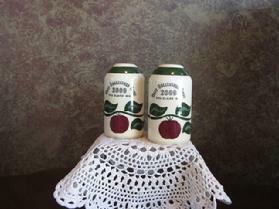 Plus, Blue Ridge was a favorite premium item that was offered by local grocery stores, Quaker Oats, Avon, among others. During World War II, changes came about to the pottery works. With the onset of war, imported dishes were largely unavailable. During this time of uncertainty Southern Potteries saw its golden years of production. While producing their own wares, Southern Potteries also worked with buyers of large department store chains and catalog companies to fill special orders. There were many great years for the ingenious pottery. However, success began to decline with the advent of new �unbreakable� plastic dinnerware in 1953-1954. In addition, imported dinnerware had flooded back into the American market after the war. These imports, particularly Japanese imports, had severely competitive prices. Rising labor costs in the states rounded out the fatal trio. In 1957, Southern Pottery�s Board of Directors voted to close. Even though everyone recognized Blue Ridge by its many hand-painted designs and informal painting techniques, there was refinement to be found in the dinnerware itself. Several different shapes of dinnerware were produced. They ranged from Skyline/Skyline Studioware (smooth and plain) to Monticello (waffle border.) The others were named: Candlewick (beaded), Clinchfield (wide rimmed), Piecrust (crimped pie edge), Colonial (fluted), Trellis (crosshatched border), Palisades (futuristic), Woodcrest (textured), Trailway (rope handled), and Astor (rim slightly cupped). 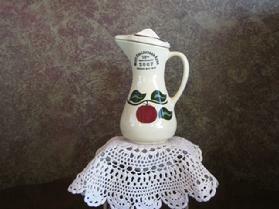 Other items like teapots and pitchers had their own different shapes. With these ceramic shape foundations and the famous patterns, Southern Potteries was able to keep up with competition and ever-changing fashions while they were still in business. Contemporary Blue Ridge collectors have keenly trained eyes that can pick out �their� pattern from a cluttered antique booth 20 feet away. In fact, it wouldn�t be surprising to discover that Blue Ridge collectors could smell out their patterns like bloodhounds. But the question that most collectors ask is, �How many patterns were made?� At one time, Southern Potteries carried over 400 patterns in open stock in its supply houses. But that�s nothing. Today it is estimated that Southern Potteries produced thousands of different patterns. Over 5,000 different patterns have been counted so far. And of those particular patterns, variation can be found in each of them. Sadly, most of the files and records of Southern Potteries Inc. have been lost, destroyed, or scattered amongst the hills. Another curious fact is that Southern Potteries didn�t name most of their patterns. (Some patterns were named �� often by clients.) Southern Potteries never even issued a product catalog. In fact, most of our favorite Blue Ridge patterns fell into a numbering system. Collectors have taken on the role of naming these multitudes of unnamed patterns. One collector�s book may call one pattern one name, and another collector�s book may call the same pattern by different name. Southern Potteries may have closed its doors in 1957, but the company still had a few unfinished orders to fill. Furthermore, many of Southern Pottery�s painters left to work for Stetson and Cannonsburg Potteries. This accounts for just one of the reasons that different potteries have produced wares similar to Blue Ridge. The Erwin Pottery (in Erwin, TN) produced many Blue Ridge reproductions as early as the 1980s onward. Many were stamped with the �Blue Ridge� logo. 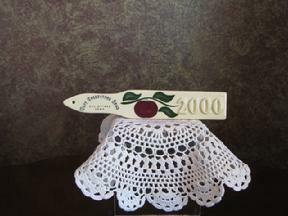 However, the word �repro� was added to the mark when the reproductions came to the attention of collectors. These specific Erwin Pottery pieces copied real Blue Ridge patterns, but the shapes they were painted on were never used by Southern Potteries. Some feel that the Erwin Pottery was carrying on the Blue Ridge tradition while others feel they were exploiting the tradition. 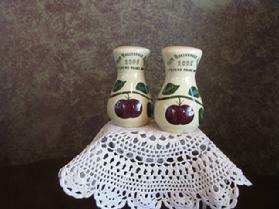 Another similar pottery is The Cash Family - Clinchfield Artware Pottery. Beginning in 1945, this family produced primarily artware and souvenir goods from a small building behind their home in Erwin, TN. Some of their workers once worked for Southern Potteries, and some of their molds were purchased from Southern Potteries as well. Unlike the early �Erwin Pottery,� the Clinchfield Artware Pottery had its own logos and marks. This pottery is collectible in its own right. From the years 1917-1923, Southern Potteries used the name Clinchfield Pottery, and several different pottery marks were used during this period of decal-decorated wares. 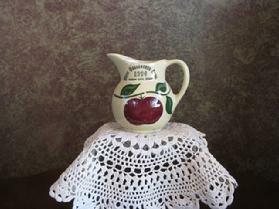 Southern Potteries Inc. introduced the name �Blue Ridge� in 1932-33. There are many different versions of the �Blue Ridge� logo, and to be genuine they must include the name Southern Potteries Inc. or the initials. However, many of the items produced throughout its expansive history were not marked at all. 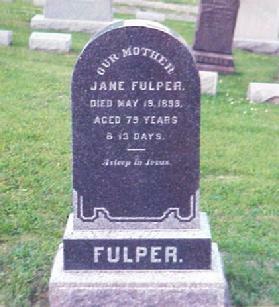 Also, several different marks were used during the same time period. However, one thing is known for certain. The mark �Blue Ridge China� dates to after 1945, since Southern Potteries didn�t introduce Chinaware to its line until this date. Marks including the words �detergent proof� and �oven safe� date to the 1950s. 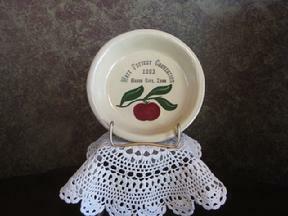 The Watt Pottery was owned and operted by the Watt family of Perry County, Ohio. 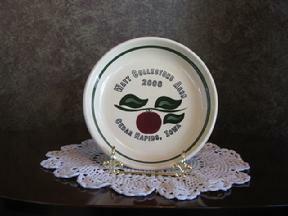 In July, 1922 the Watt Pottery was incorporated on the site of the old Burley Pottery in Crooksville, Ohio. It remained in business until a fire halted production in 1965. Through the 1920s and early 1930s the Watt Pottery manufactured stoneware crocks, butter churns, preserve jars, and jugs. These are marked with an eagle or acorn stamped in blue, with the gallonage marked in a circle. In 1935, the Watt pottery dropped its stoneware line in favor of more modern oven wares. The lightweight clay body gave the wares the necessary resilience to go from ice box to oven. These earliest oven wares are not well identified. By the late 1940s, the Watt Pottery concentrated on the kitchen-ware glazed in solid colors. The patterns are called: Moon & Stars, Arcs, Loops, Diamond and Grooves. All are descriptive names coined by collectors. Although not all pieces are marked, the bottom mark associated with 1940s Watt ware is an impressed: "MADE IN U.S.A." . Pieces may also be marked: "Oven Ware" or simply have the bowl size impressed. In 1949, the Watt Pottery began hand decorating its wares. The patterns are simple in nature, with as few brush strokes as possible to allow low production costs. The pieces were decorated by teams of three decorators. The bright colors against the deep cream clay give Watt Pottery its unique country appeal. 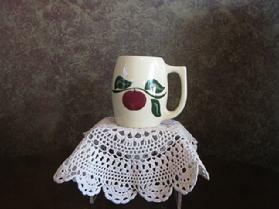 The first hand decorated patterns are called the "Classic Patterns" and were produced from 1949 until about 1953. They are: Rio Rose, Moonflower, Dogwood, White Daisy, and Cross-Hatch. The hand decorated patterns most sort after by today's collectors and their introduction dates are as follows: Starflower - 1951, Apple - 1952, Cherry - 1952, Silhouette - 1953, Rooster - 1955, Dutch Tulip - 1956, American Red Bud (Tear Drop) - 1957, Morning Glory - 1958, Autumn Foliage - 1959, Double Apple - 1959, and Tulip - 1961. Most pieces of Watt ware are well marked. 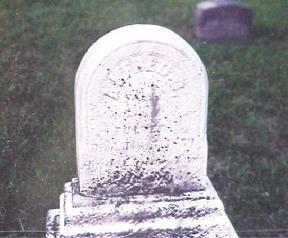 The marks are large, often covering the entire bottom of the piece. They usually consist of one or more concentric rings deeply impressed into the bottom. The words, "Watt" and "Oven Ware U.S.A." are impressed as well, although some pieces have only one phrase, not both. Classic Patterns often feature a script "Watt" with no circles. Most pieces also have the mold number impressed in the center, making identification easy. The most significant pieces which were not marked are the ice bucket (all patterns), and the Apple dinner plates.